Dental injuries that occur in New Zealand can often be claimed through ACC. Depending on the type of injury sustained, your general dental health and if you have claimed against this tooth previously, ACC may cover between 50-85% of your dental costs. Please be aware that if you have decay or previous work on the tooth that is being claimed for or if you have gum disease, ACC may reduce the amount that they would normally pay towards your dental treatment. You will need to lodge a claim for your dental injury within a year of the accident occurring and the longer you wait, the more information ACC may require before they process the claim. If the dentist feels that there may be a chance that ACC may not accept the claim, they may ask you to pay for your treatment initially with an agreement that should ACC pay for the treatment, you will be refunded the portion that ACC will cover. If you have had a recent dental injury and want to make a claim, book in with your dentist as soon as possible. 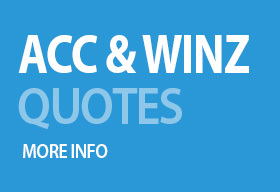 If you are receiving a benefit of any sort, WINZ may help you pay for your dental treatment. To find out if you qualify, call your WINZ case officer who can advised you more about this. If you do qualify, you will need to book in with the dentist for a quote which you will need to take back to WINZ. If they approve the quote, then you will be given a payment slip. Call the dentist to make an appointment.